At visishta we care for your child’s care education, holistic development and growth. Considering the same our early education program include innovatively designed Integrated curriculum which caters to the physical, motor social, emotional, and cognitive development. 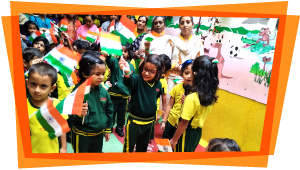 Our team of trained teachers and staff cater to the various needs of a child in to days environment at every age and stage. 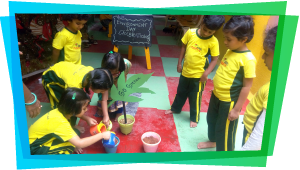 Visishta an Eco-friendly school inculcates the habit of planting trees in young minds every year. Tree plantation which usually takes place every year was followed by a procession by our little ones on the streets with a slogan “ Plant trees, Save Life”. This Procession is one more feather on our cap. Grandparents of Visishtaites made us to cherish the memories of grandparents day. Their involvement and participation in the events and games were amazing. Children usually learn about color during their pre-school years. The ability to identify colors is considered a marker and milestone in a child’s cognitive process. We use many tools to help children learn about colors in their pre-school life. In order to take the concept deep into the minds of our young champs. Enacting a market scene was done by visishta team to make them understand the concept of weight, rupees, money value. 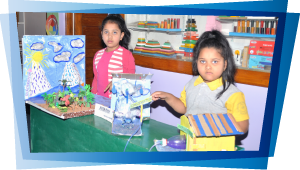 Science exhibition exhibited the talents of our little Einsteins, Thomas Alva Edison’s and Kalpana Chawla’s project models and presentation given by our students with the help of teachers and parents transformed visishta into a science park. We at visishta innate the talents and capacities of our children. We do not limit a child by our own learning we allow them to learn on their own through various indoor and outdoor activities.“We give them toys that are powered by their imagination not by batteries”. Indoor and outdoor activities at visishta are well encouraged by our parents who support us by understanding that “Play is the highest form of research”. This is another uniqueness of Visishta we at visishta – the unique play school celebrates aksharabyasa with vidyarambha program in a traditional way. Visishta celebrates aksharabyasa every year on vijayadasami day after saraswathi pooja. A child is seated on the parent’s lap and start learning to write in a plate with paddy or rice under the guidance of our learned pundits. 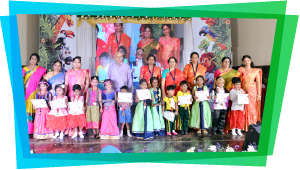 Visishta celebrated children’s day extravagantly. Few games were conducted for parents along with their kids. Cooking without fire by moms with their kids was the highlight of the show. Children were so excited to participate in the event along with their parents. Visishta celebrates all festivals to create and bring little kids from various backgrounds in harmony. The importance and reason for celebrating festivals are well explained to students by teachers. Children enjoy participating in the various events and games which will be organized according to the occasion. They get dipped in the hues of various Indian festivals. As per the pledge of our country to preserve our rich and varied heritage to reignite the spirit of patriotism national festivals are celebrated in visishta every year. Our curriculum is enriched with the inclusion of carefully planned field trips. Field trips have provided children with an additional learning experience, several opportunities in their standard educational environment. A unique way of graduating UKG children. We at Visishta, symbolically give light to every student from a lamp which is filled by oil(Knowledge) and lit by teachers(teaching). Summer camps at visishta are organized to keep the kids busy with amazing fun-filled activities. We see that they spend their summer filled with fun, creativity, imagination, physical and cognitive activities. Our summer camp programs include age-appropriate activities. We plan the activities for children aged between 2 – 15 years. The activities are planned in such a way so that the children can participate at a level which will challenge them. We make sure that all our summer camp participants go out every year with satisfaction and time spent at visishta’s summer camp. 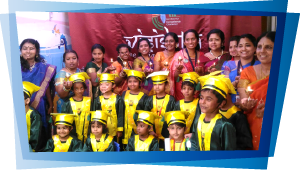 To bring the hidden cultural talents of our children visishta celebrates annual day extravagantly. It’s learning to win and lose, sports is an education to face success and failures. 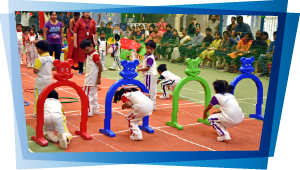 Sports day at Visishta is always conducted in an indoor stadium with innovative games and innovative themes to bring out the sportsmanship in each and every child.